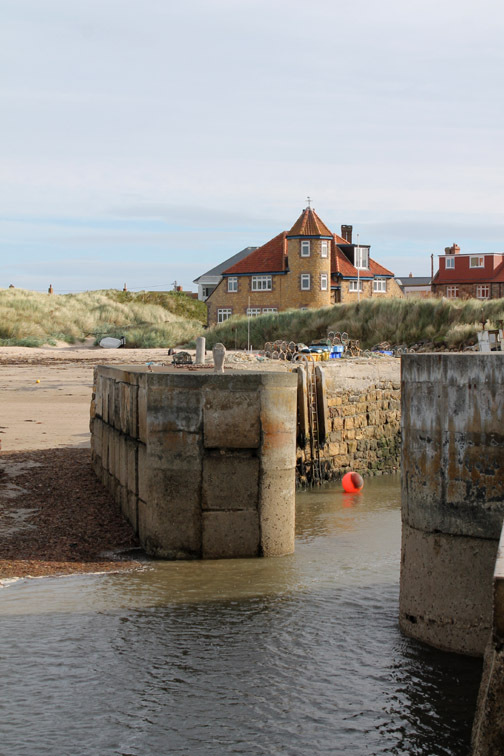 " Bamburgh Bay Walk "
Accommodation : The Beach Court B&B, Beadnell, Northumberland, Uk. 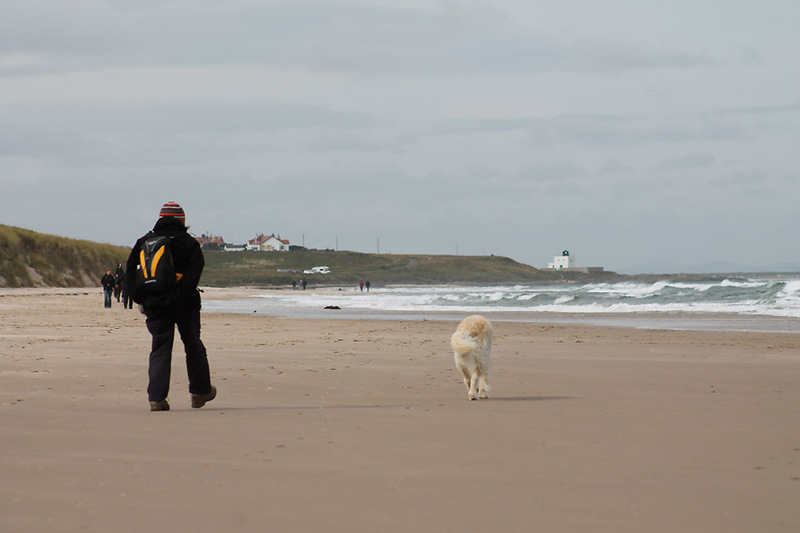 Date of walk: Tuesday 17th September 2013. 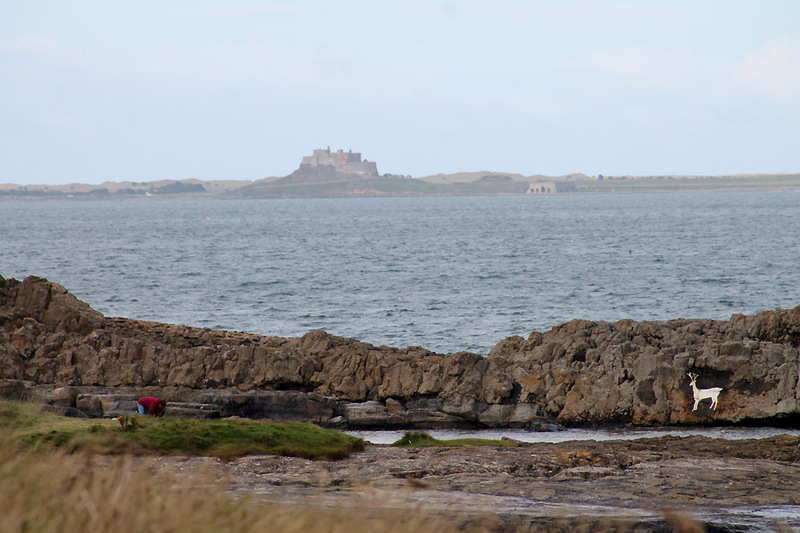 Places visited : Bamburgh Bay to Harkess Rocks and back. Walk details : 3.5 mls, negligable feet of ascent, 2 hours 35 mins. Highest point : Probably the top of a sand dune on the walk to the beach. Tuesday morning dawned sunny and bright, the wind having eased somewhat. 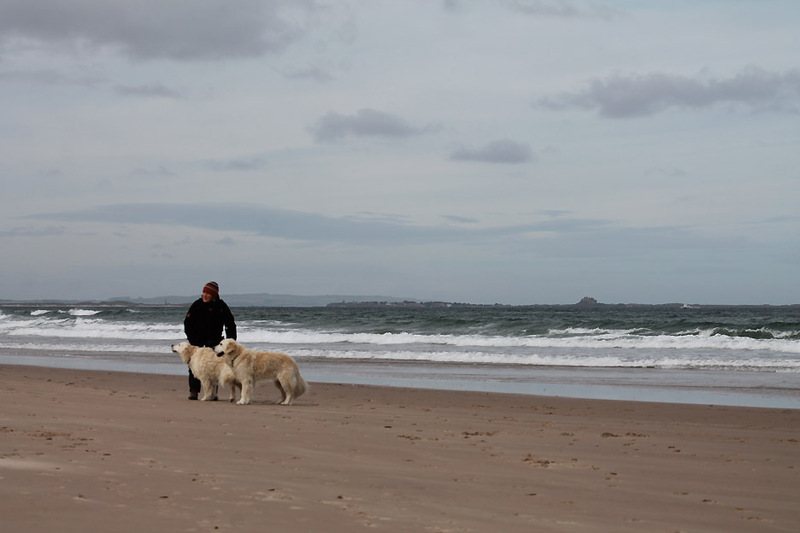 A walk on the beach before breakfast gave the dogs chance to stretch their legs. 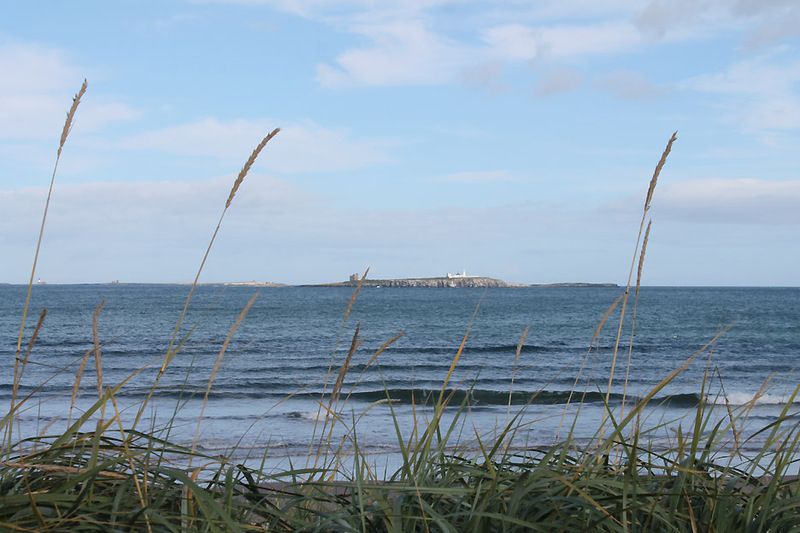 From our Beadnell Beach Court accommodation it is just a one minute walk to this lovely place. 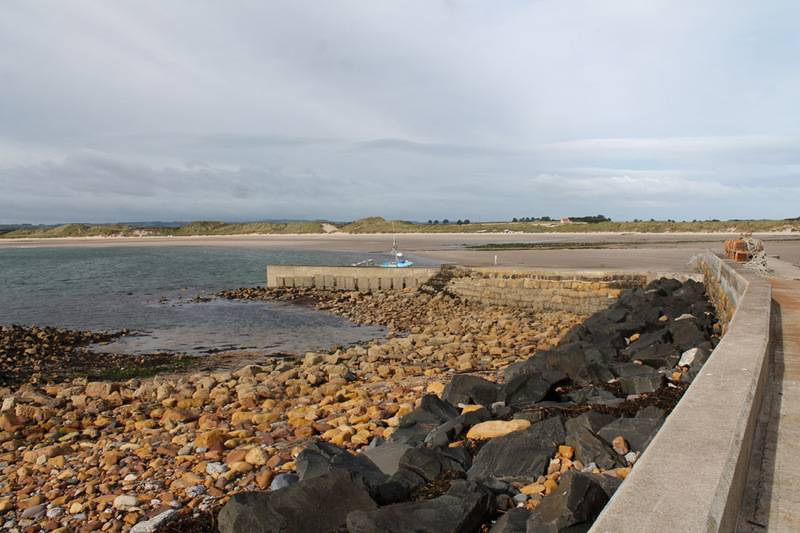 The original jetty has been extended using old concrete blocks that started life as tank traps on the upper part of the beach. 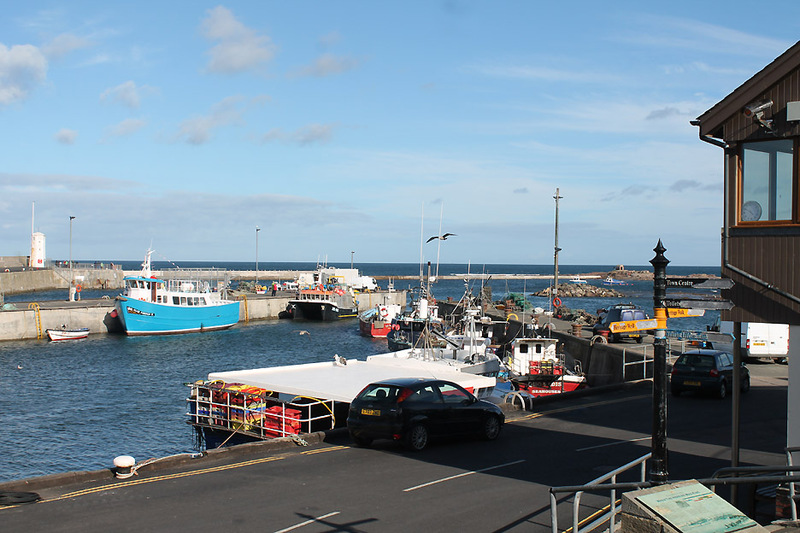 You can see them in place on the outer jetty, neatly secured with a top cap of cement and now offering extra protection to the boats of the bay. That's what you call good re-cycling . . . eyesores transformed into useful devices. The tide is out and the structure of breakwater is seen . . .
. . . as is the interior of the renovated Coble. Time for breakfast . . . cereal and fruit and mega Craster Kippers . . . magic ! Better go for a walk to burn off the calories. 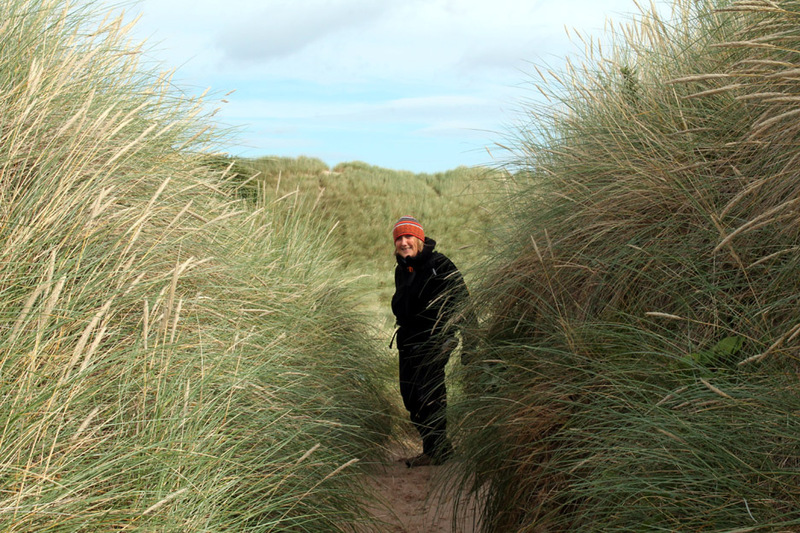 A magical mystery tour through the marram-grass covered sand dunes. In between we glimpse a view of the landmark that defines the location . 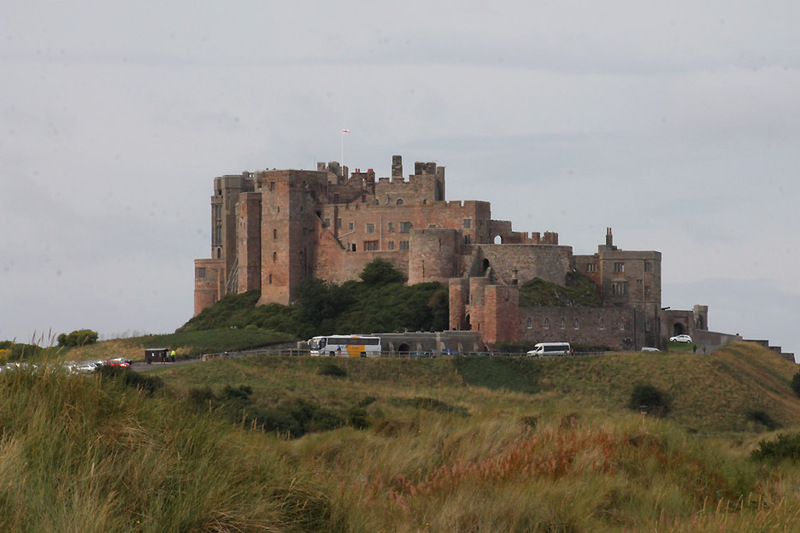 . . Bamburgh Castle. On through the dunes and we soon reach the beach. 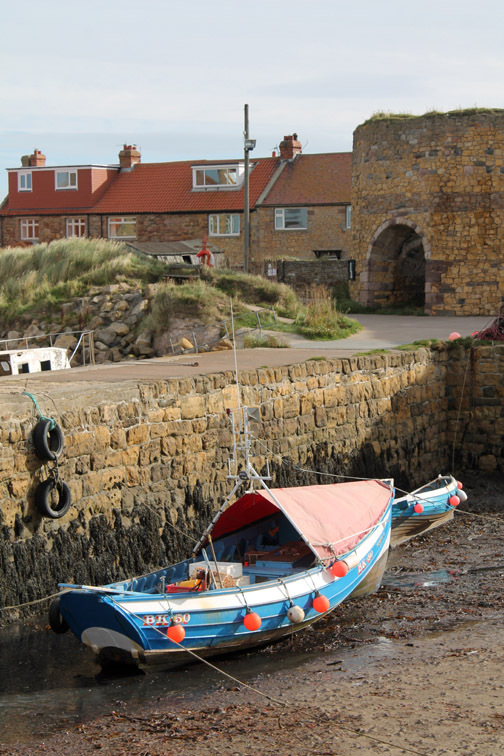 and now supports the large fleet of tourist boats that take visitors out to see the bird life and seals of this protected National Trust landscape. 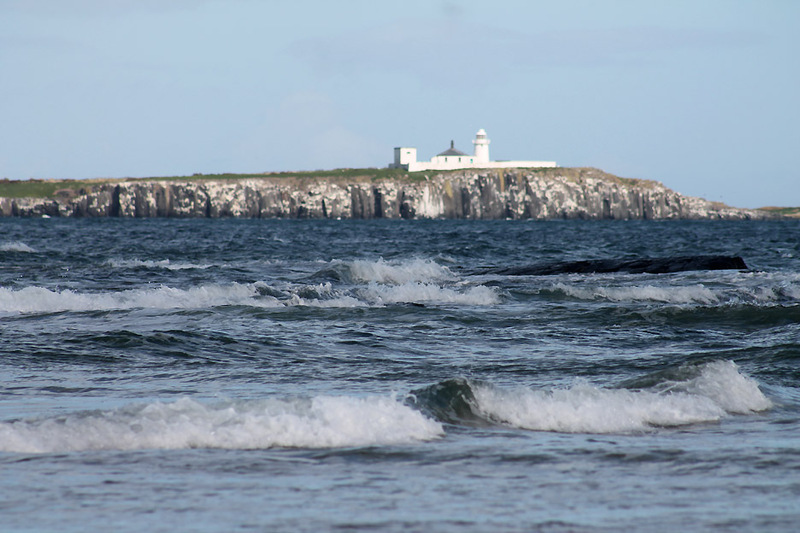 On the Inner Farne there is an old tower, chapel and the Inner Farne lighthouse. of the SS Forfarshire when the ship was driven by a storm onto Harcar rocks. Grace was awarded an RNLI Silver Medal for Gallantry. Gold medals were awarded to both Grace and her father from the Royal Humane Society and they received a huge £50 from Queen Victoria. 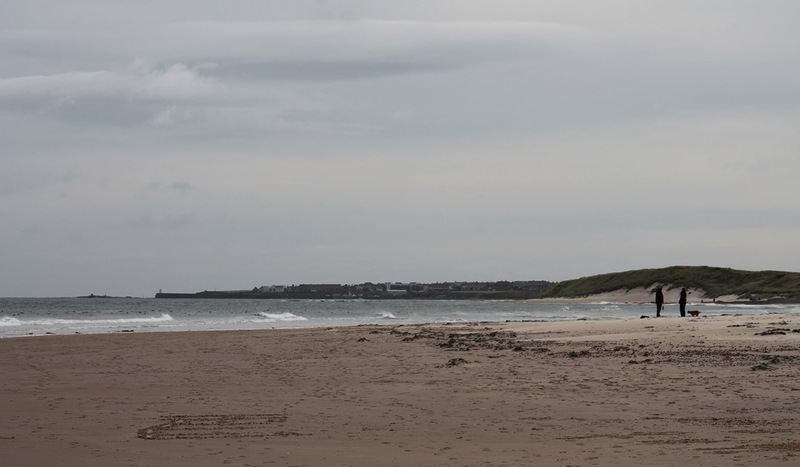 The RNLI founded the Grace Darling Museum in September 1938, exactly 100 years after her famous rescue. Looking north now as we start out along the beach . . . another totally dog-friendly location. What was nice that it was also a people-friendly location . . . everyone we saw nodded or said hello and often chatted to us and the dogs as we passed. 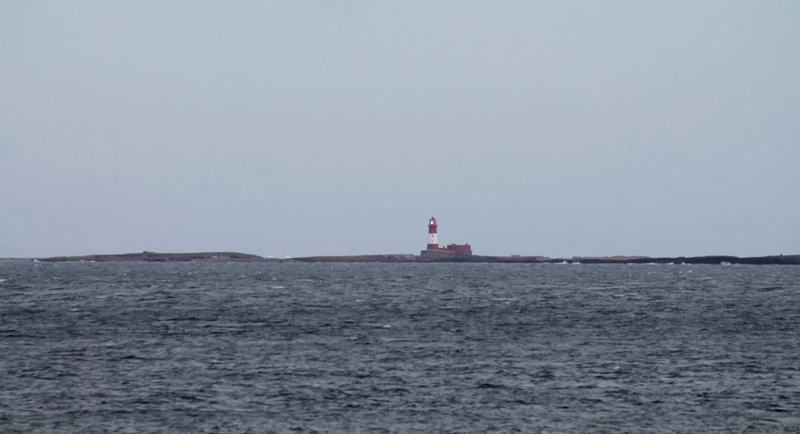 At the far end of the bay is another shore based light at Blackrocks Point. 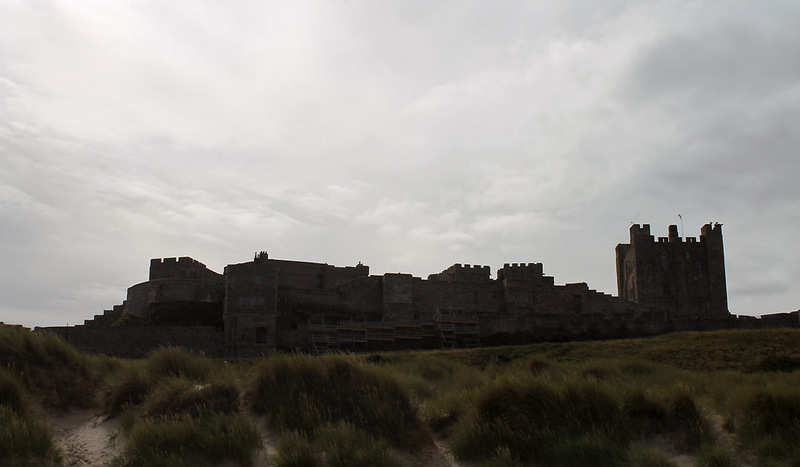 In between we pass the castle, set back on a rocky outcrop at the edge of the sea. The linear nature of the design becomes apparent as we get this side-on view. Towards the top of the beach now, more people as it is nearer the road parking and the village. 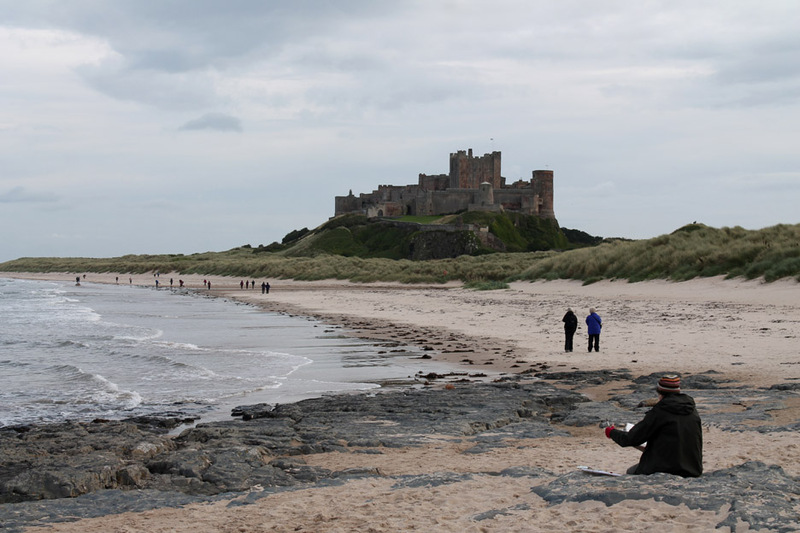 If you have a moment check out the sand castle on the left of the picture . . . 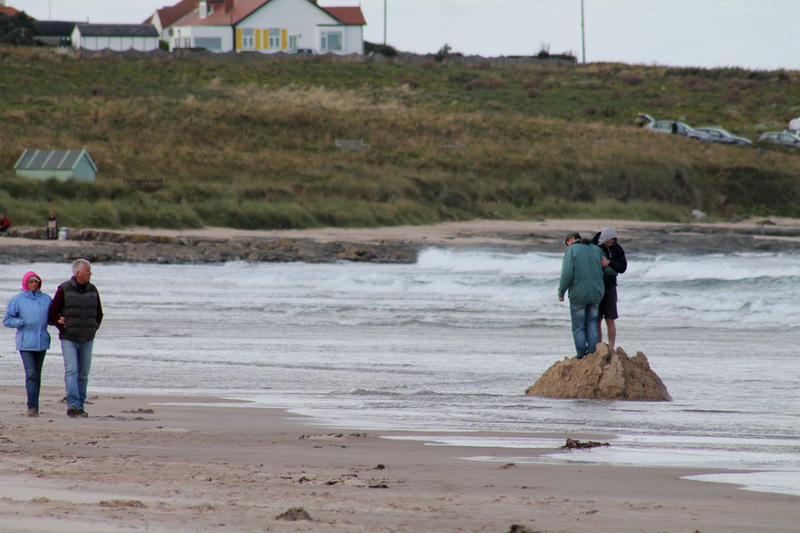 These two guys had built a large castle and were stoically riding out the relentless action of the incoming tide. but eventually they had to submit to wet feet and an undignified retreat as their partners sat and watched their antics from safe above the tide line. 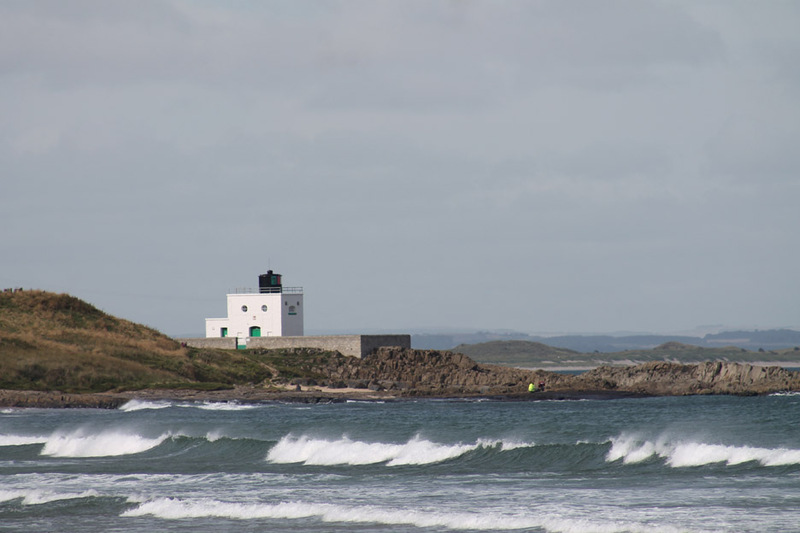 but it was still strong enough to blow the tops off some of the waves. 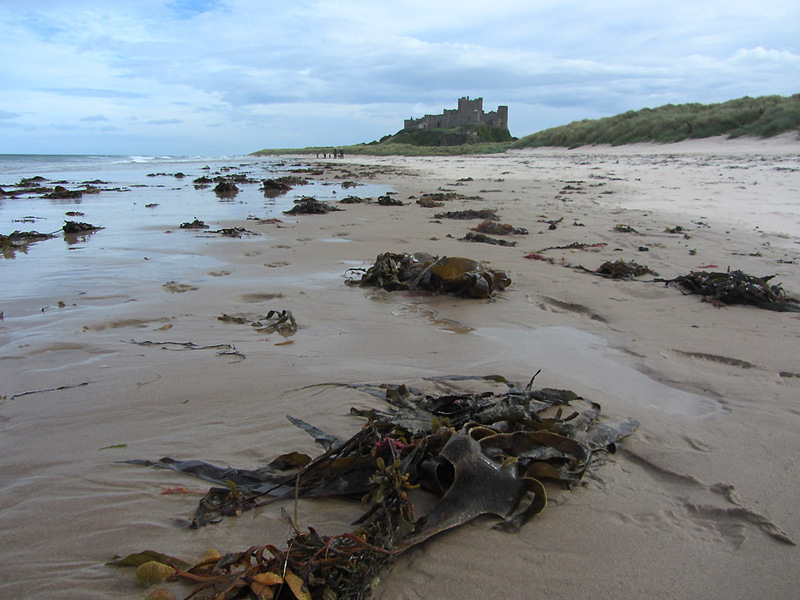 Lindisfarne Castle stands proud on Holy Island some four and a half miles away. after someone had painted a rather nice white stag on the vertical part of the shore-facing rock wall. 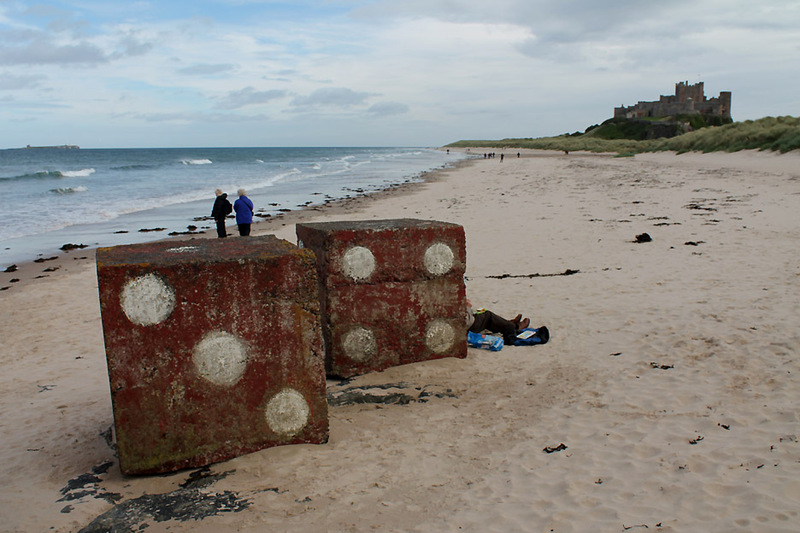 In fact there had been an artist at work here on the beach too . . .
still they made a fine backrest for some chap to sit and eat his sandwiches ! but this lady was slowly developing her interpretation of the beach and castle using pen and paper. Colorful seaweed interspersed with the bladder wrack cast aside on the beach after recent poor weather. 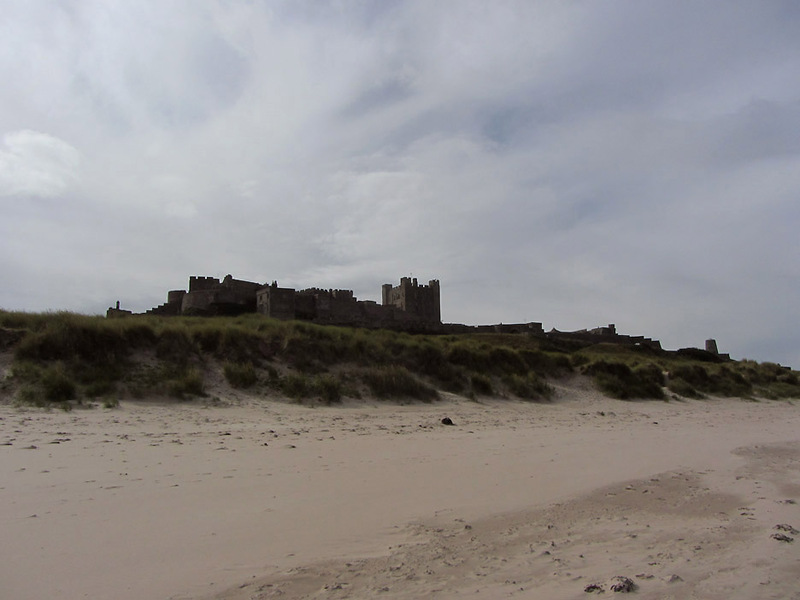 We re-traced our steps back down the beach, passing the castle once more. Taking a close look this time, mainly due to the incoming tide, we could see some major renovation in progress to the outer walls. Ever present was the sea and the sound of the waves . 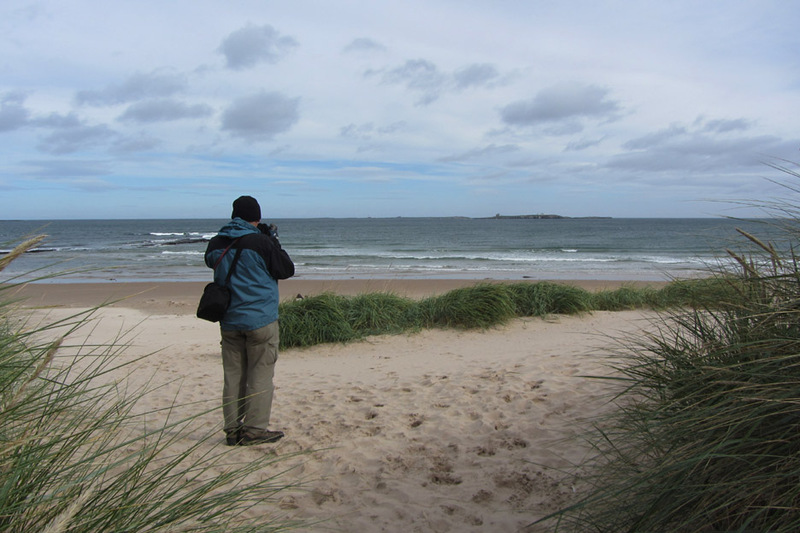 . . the visibility and the colour was improving as the clearer weather arrived. 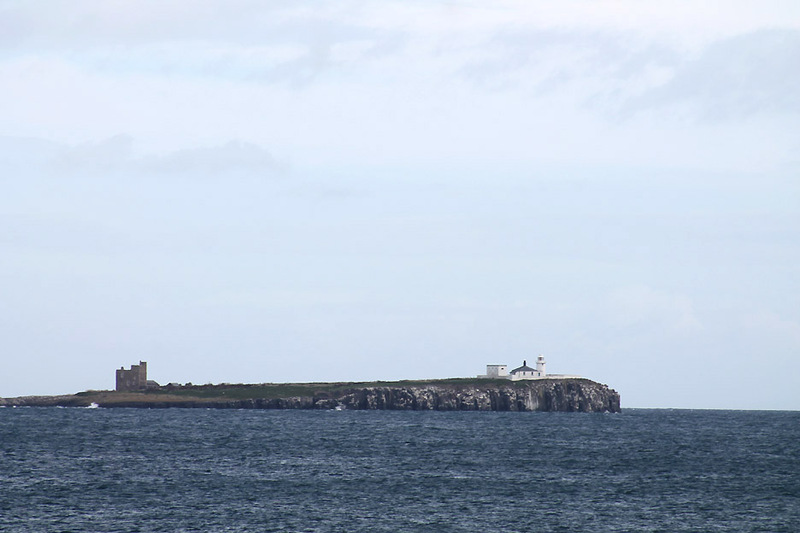 On the sea cliffs of the island we could now pick out the nesting colonies of the Inner Farne seabirds. Time to be heading back through the dunes to the car. 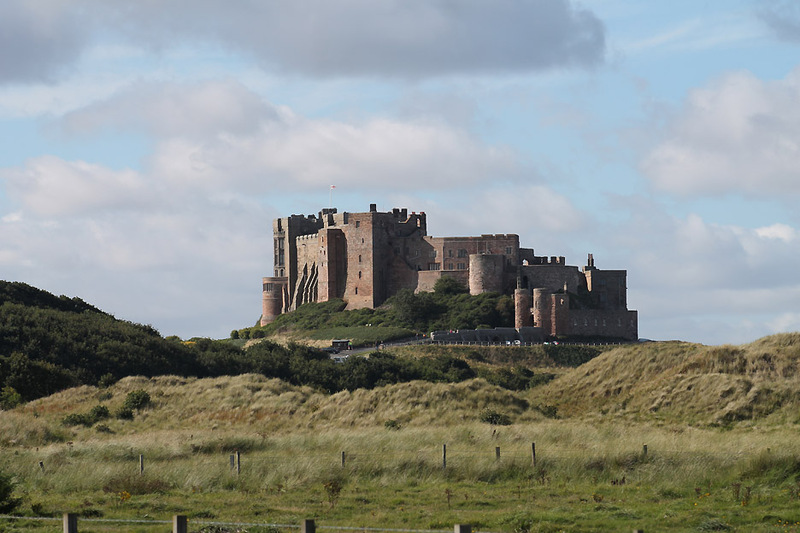 The clearer weather and a lower angle of sun meant we had a particularly good view of the castle on the way back. 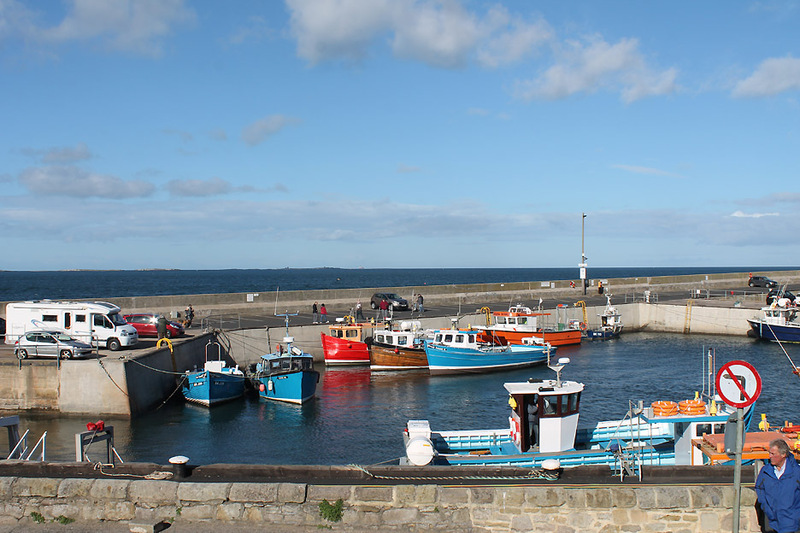 to call into Seahouses and enjoy the colour and activity of the fishing fleet and tourist boats in the harbour. 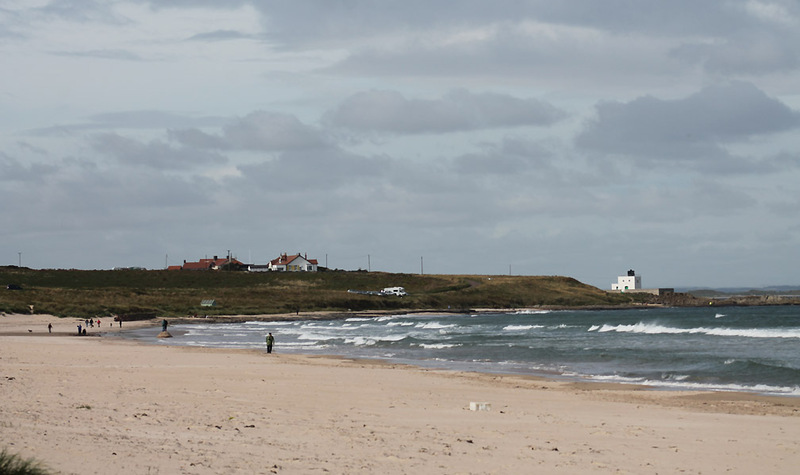 and the advent of the tourist trade has enabled the town to become a real seaside destination in the north of England. as we wondered the harbour once again, this time later on in the evening, after a nice meal in town. Technical note: Pictures taken with either Ann's Canon Sureshot SX220, (my phone, see picture above) or my Canon 1100D SLR digital camera.